Makes a perfect gift to give to anyone. This beautifully crafted pieces of jewelry is 18KT. Gold over sterling silver, and features an 18” gold rhodium plated chain. 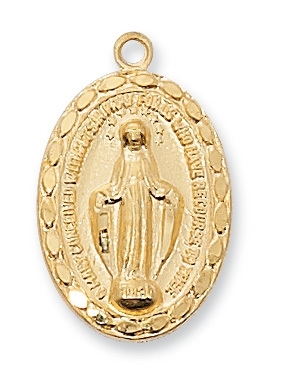 Miraculous Medal, Inlayed Heart Our Lady of Lourdes Sterling Medal Miraculous Medal--Sterling Silver or 18 K Gold over Sterling Sterling Silver Our Lady of Guadalupe Pendant, Stainless Silver Heavy Curb Chain, 1" x 5/8"
Our Lady of Perpetual Help Sterling Medal 2.0cm Sterling Silver Floral Patterned Medal with Mary Sterling Silver Miraculous Medal SS2334 Sterling Silver Our Lady of Lourdes Pendant, Sterling Silver Lite Curb Chain, Medium Size Catholic Medal, 3/4" x 1/2"